Welcome to Holly class’ page where you will see our journey into 2019. My name is Mrs Haddow and this is my third year in KS1. I cannot wait to have fun and enjoy having a PART–E (Pride, Achievement, Responsibility, Teamwork and Enjoyment) at Bowsland with the new Holly class, celebrating our success with our Key stage 1 team. We will be sharing with you our learning and all the exciting opportunities we are going to have this year on our class web page, starting with a fantastic topic of; Once Upon A Time…, which is really going to show our creative and imaginative side. Watch this space for updates of our learning and all the fun we will be having. Today Holly class invited their families in to complete some learning. We were looking at a place we could visit on our trip around the world. We went to SAN Francisco in America. Here we saw the Golden Gate Bridge. Our first part of learning was researching facts about the bridge and sketching it. Did you know it took 4 years to build the bridge? After lunch we then built the bridge using resources in the trays, they were; play dough, blue tac, straws, tooth picks, scissors and elastic bands. We all managed to make a bridge and were really proud of our creations. Thank you to the families that came and joined us. During our Mantle lessons we have become ‘The Rats Publishers’. We have learnt all about what a publisher does and have really taken to our role. We are currently in the process of making some books about ‘The Great Fire of London’ to present to Bradley Stoke Library for other children to use. Here you can see us with a lady called Deena who is from the library. She came in to see how we were getting on and told us she was really excited to soon see the finished products. Our books will be on show in Bradley Stoke library by the Christmas holidays where we will have a special display for our work. On Monday 8th October we went to Berkeley Castle. We had so much fun! First we went inside the castle which was so big and had so many stairs and rooms. We asked lots of great questions and also knew lots of answers from our learning in school. Mrs Haddow was very proud of us! After we went on a dragon trail to find 8 baby dragons. That was so fun as we got to explore the castle’s grounds and solve the clues. Next we went and dressed up as knights, kings, princesses or dragons… look at us in the pictures! Our final activity was exploring the woods and playing on the equipment. Here we found lots of conkers and went on lots of adventures through the trees. We had the best day! On Monday 1st October PC Smart came to visit us. He talked to us about how he helps people and showed us his equipment, such as his baton, his handcuffs and his walkie-talkie. We all tried on his hat and learnt that it is tall, so that it can be seen above the crowds. Then he read us his new book called Officer George, about a police man and the things he does in the day to help people. We had lots of questions and some of us were inspired to become new police officers. PC Smart told us that we would need the skills we learnt in school to help us. What a lovely afternoon, thank you PC Smart! In outdoor learning we were applying our maths knowledge learnt this week by partitioning numbers using the part-whole model. You can see how confident we are at using it and are all very proud of our hard work. In Week 2 we looked at a picture of a castle and were discussing how and why people attacked or defended it. In teams we worked out what they used and why they were doing it. It was very interesting. In Mantle we have been looking after a dragon for the king whilst he is away. Unfortunately, after finding lots of clues like bitten food, dragon scales, footprints and broke chains, we realised that he had escaped. We were so worried but we thought very carefully and realised he must have been missing home and flew back to his castle. 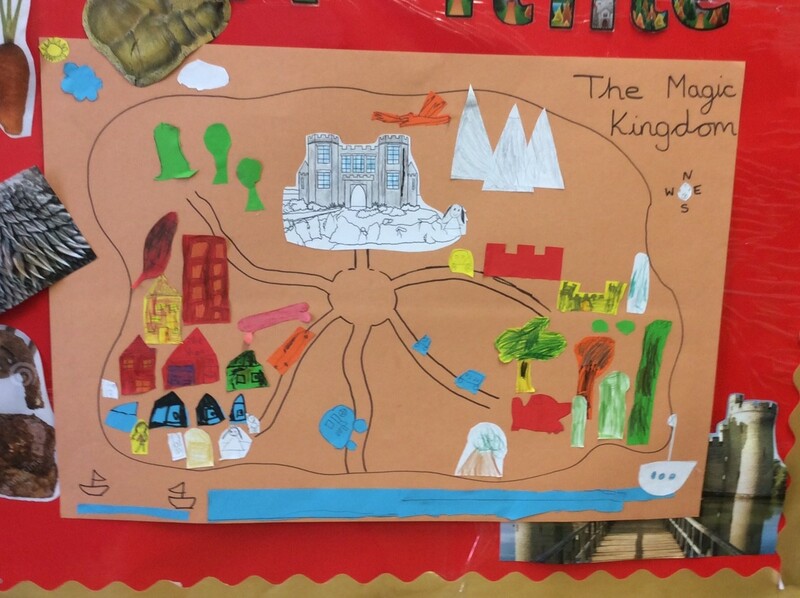 We weren’t sure where the castle was so we used our imagination to picture what the kingdom would look like and created a map to help us.